The beginner taster workshops are aimed at people with no previous experience on the instrument and instruments are provided. The sessions are small and intimate to ensure that each learner is given sufficient attention. See below to meet the team members of the nyckelharpa pool. 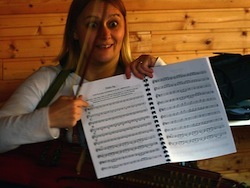 To book your own nyckelharpa workshop contact us! Private lessons in North Essex - £30 per hour. lessons are also available - £20 per hour. Lessons are available whilst we are on the road, check the map to see if we are near you and can arrange a time. - £30 per hour plus fuel cost. Members of the nyckelharpa pool. The workshop team now consist mostly of nyckelharpas by Olle Plahn.